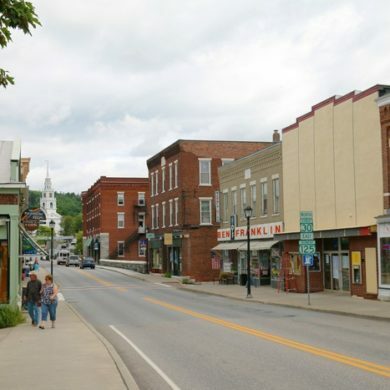 Roaming the streets of Downtown Middlebury is like roaming into a living history. In fact, the village is listed on the National Register of Historic Places. There are beautiful churches and a waterfall smack dab in the middle of it all. Passing right through the heart of the historic village is Otter Creek, the longest river in Vermont. In the mood for a toddy? Otter Creek Brewery, Woodchuck Cider and Appalachian Gap Distillery are all nearby. We visited the town (and the aforementioned purveyors of alcoholic beverages) on a Vermontology Tour, so we could sit back and enjoy the spirits without having to drive afterward. Middlebury was a hub for industry in the state, giving way to Vermont’s marble trade as well as agriculture including the farming of Merino sheep and breeding of Morgan horses. If you’re feeling hot to trot, you can even visit a museum about the horses for a real ‘heyday’. The town was also home to the first community college in the United States, the first institution of higher learning for women and the first chartered village museum. Middlebury College still stands today, acclaimed for its performing arts department and sports teams. The Henry Sheldon Museum of Vermont History is the oldest community-founded museum in the country, with exhibits ranging from nineteeth-century small-town life to an art gallery featuring Vermont works. You can also visit the Danforth Pewter Workshop and Store for a unique factory tour and lovely souvenirs. This is a town dedicated to wellness in a state with incredible natural beauty and plenty of outdoor space to live a fit and active lifestyle. Only around 8,500 residents make Middlebury their home, yet it offers two health clubs, as well as yoga studios and naturopathic physicians. Needless to say, Middlebury has packed a lot into its little spot on the map.